From rodeo champion to stuntman to movie cowboy star for over 20 years, Hoot Gibson was one of the most popular western stars on the silent screen, ranking second only to Tom Mix. With his easy combination of light, breezy, boyish charm, comedy and riding abilities, the 5' 9" Hooter filled a gap between the austere William S. Hart or Harry Carey and the flamboyant Tom Mix. Hoot appealed to both children and adults—especially women. 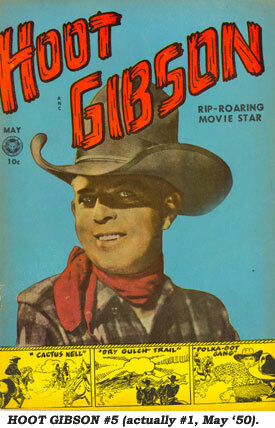 In his FILMING OF THE WEST, Jon Tuska calls Hoot, “The most popular star at Universal in the ‘20s. His fan mail required four vans a week to transport it. His 1924 contract called for a million dollars to be paid to him over a three year period.” By the mid ‘20s, he was one of Universal’s top paid stars, earning $14,500 per week. And he spent it, rivaling even Mix in self indulgence…fast cars, motorcycles and airplanes. Although he made a few talkies at Universal, his time of major stardom was over and Hoot was relegated to independent films. Hoot found himself strangely out of place in the new era of singing cowboys and went into self retirement in ‘39, returning (a bit heavier) in a last hurrah with old pal Ken Maynard for the well remembered Trail Blazers series. In the ‘50s, Dell, Fawcett and DC had primarily snapped up the publishing rights to all the current major western movie stars. Hoot hadn’t starred in westerns since the ‘43-‘44 Monogram Trail Blazers series, but lowly Fox Features Syndicate evidently thought there was still enough luster left in Hooter’s name by way of constant TV showings of his early talkies that they could sell a few comic books. Fox canceled MY LOVE STORY after four issues but continued its numbering, thereby making the first Gibson issue in May ‘50, #5. It sported a photo cover and a film-still back cover. Art by Ken Battefield (a near hack artist) looked nothing at all like Gibson. Three different artists drew Hoot in the second issue (numbered #6 in July ‘50) with the second story capturing his likeness quite well. This issue also had front and back photo covers. Four more artists (including Wally Wood) worked on Hoot in #3 (9/50), probably the best overall issue. This one had painted front and back cover art. In all issues Hoot’s horse was named Vulcan…don’t ask me why. None of the stories captured Hoot’s unique brand of humor, basically making him just another two-gun comic book cowboy. 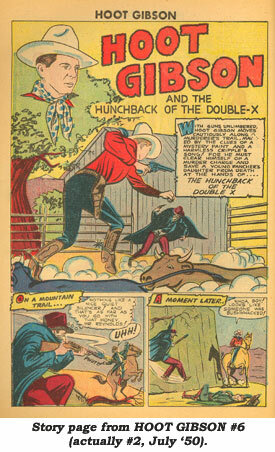 In late 1950, Fox stitched together remaindered comic books into HOOT GIBSON’S WESTERN ROUNDUP, a 25¢ 132 pg. giant which included Hoot #3 along with issues of SAMSON AND DELILAH, BLUE BEETLE and MY INTIMATE AFFAIR. Collectors may locate variable copies of this giant, depending on what cheapo publishing house Fox had left over that year. Sales were obviously not good as no more Gibson comics appeared. All three issues are hard to locate, commanding $70 prices in Fine when you do. The WESTERN ROUNDUP giant reprint is way overpriced in the COMIC BOOK PRICE GUIDE at $120 in Fine.